The 7mm Remington Magnum was introduced in 1962, the .300 Winchester Magnum a year later, in 1963. Remington’s Big Seven took off like a rocket, and for many years was the world’s most popular cartridge to wear the “magnum” suffix. The .300 Winchester Magnum was slower to catch on. There were reasons for this. Cartridge design theory has it that a cartridge case needs a “full caliber neck” to properly grip the bullet. This means a .30-caliber cartridge should have a neck of at least .308-inch. In order to cram as much powder space as possible into a case that would fit into a .30-06-length action, Winchester’s engineers gave it a 2.620-inch case, longer than the 2.494-inch case of the .30-06, but with a short neck of just .264-inch. Purists suggested that dog would never hunt, but there was more. The .300 Winchester Magnum was designed to replace the long-beloved .300 H&H, then the world-standard fast .30-caliber. 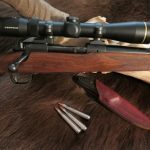 Just a year later the even more beloved pre-1964 Model 70 was replaced by the post-1964 Model 70, and Winchester’s new .300 was stranded in an unpopular platform. Left to right, .300 H&H, .300 Winchester Magnum, .300 Weatherby Magnum, .300 Remington Ultra Magnum. These four are the fast .30s Boddington has the most experience with. All have their attributes, but the .300 Winchester Magnum is the most popular and most available, and today the velocity gap has narrowed between it and the longer-cased, faster cartridges. I like the 7mm Remington Magnum, and I’ve taken a lot of game with it over the years; it’s effective, accurate, and has little recoil. However, at heart I’m a fast .30 guy. I had a .300 Winchester Magnum back in the 1970s, a great piece of walnut surrounding a Mark X Mauser action. I never hunted with that rifle before it was lost in a burglary. In the rebuild I got a left-handed Weatherby Mark V in .300 Weatherby Magnum, and I’ve been a fan of Weatherby’s .300 ever since. Mind you, I’ve dabbled with most of the fast .30s. In the early and mid-2000s I spent a lot of time with the .300 Remington Ultra Mag, a great cartridge. I’m a recent fan of the .300 H&H; with handloads it’s amazing what this old cartridge will do, and that long, tapered case feeds like a dream. In 2010 I took a Blaser R8 in .300 Blaser Magnum to Nepal. It was impressive, but when it became apparent that the Blaser unbelted magnums weren’t going to be marketed in America, I traded that barrel for, you guessed it, a .300 Weatherby Magnum barrel. In 1989 and again in 2007, for my Safari Rifles and Safari Rifles II books, I did surveys of all the African professional hunters I could reach, both times receiving more than a hundred responses. Certain differences in these surveys were interesting. In 1989, under the heading of “recommendations for medium plains game” the .30-06 was the favorite (thirty-three mentions), followed by the 7mm Remington Magnum (twenty-five) and the .300 H&H (twenty-two). The .300 Winchester Magnum was barely there with just five mentions. Fast-forward eighteen years. In 2007 the 7mm Remington Magnum nearly dropped off the survey, as did the .300 H&H. The .30-06 remained strong, but in appropriate game categories the .300 Winchester Magnum came in right behind the .30-06. Although I’ve never been a fan, the .300 Winchester Magnum has been an inescapable cartridge. As a gunwriter I’ve used it in many rifles, and I’ve hunted with it quite a bit. Despite the short neck, as we’ve all learned, it’s a very accurate and efficient cartridge. During the Gulf Wars it’s gotten a tremendous boost. Many of our Special Operations units now use it because it’s accurate, has a lot more reach than the 7.62x51mm NATO round, and can be built into a lighter platform that doesn’t kick near as much as a .338 Lapua. When this photo was taken the barrel on the Jarrett .300 Winchester Magnum (bottom) was brand new. Accuracy with the production LAW Model 704 was very similar, and both, depending on the load, were plenty good enough for any hunting purpose. Today, after break-in, the Jarrett has a slight edge, but both are superbly accurate rifles. So why this turnaround? Well, in part the 7mm market has been diluted. 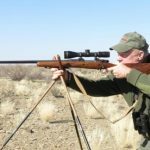 The 7mm Weatherby Magnum goes back to the 1940s, but now we have the 7mm STW and 7mm RUM, and the 7mm WSM and 7mm RSAUM do everything the 7mm Remington Magnum will do, but in short actions. But that’s not really a valid argument, because there have long been faster .30s, and now we have the .300 RUM, .30-.378 Weatherby Magnum, and a slew of faster wildcats and proprietaries. I think, instead, the truth is finally out, and 7mm fans aren’t gonna like it. The 7mm offers a lower-recoil alternative to the .30, and this is valuable. Its heavy-for-caliber bullets are efficient and effective. But a 7mm will not do what a .30-caliber will do. Although the 7mm is awesome on the deer/sheep/goat-caribou classes of game, all of my life both western guides and African PHs have admitted that 7mms have wounded a lot of elk and large plains game. On the other hand, there isn’t much you can’t do with a 180-grain .30-caliber, and a bit more that you can do with a 200-grain .30 caliber. So I think the 7mm Remington Magnum and .300 Winchester Magnum, the world’s two most popular magnums, have flip-flopped positions based primarily on the greater versatility of the .30-caliber. Still, the .300 Winchester Magnum is a cartridge I’ve been slow to accept. As I said, I’m a .300 Weatherby guy, although I readily concede that the unbelted .300 RUM has more case capacity and, from a case design standpoint, has more accuracy potential. Honestly, I probably wouldn’t have recognized the true (and current) worth of the .300 Winchester Magnum if it hadn’t been forced on me. My friends at the new Legendary Arms Works (LAW) came on board as a sponsor of our The Boddington Experience TV series. For filming I needed a rifle with maximum versatility, and to me that’s always a fast .30-caliber. They weren’t yet chambering for .300 Weatherby or RUM so I got the next-best thing, a .300 Winchester Magnum. I’ve used it to film most of our episodes for the last two years. A fine Eastern Cape greater kudu taken at 300 yards with the Jarrett .300 Win. Mag. No matter where you are, there are few things you can’t do with a fast .30-caliber and a good bullet. In the same period, a couple of years ago, South Carolina riflemaking legend Kenny Jarrett convinced me that I had to have a rifle on his new receiver (which he was making in left-hand action). Of course he preferred that I get his proprietary .300 Jarrett. That’s an awesome cartridge, but non-standard cartridges complicate my life. So I pushed my default button and asked him to build me a .300 Weatherby Magnum. It was at a show, and we old shooters are all a bit deaf, so I guess he didn’t hear me. When, in due time, the rifle arrived I was horrified to see that it was a .300 Winchester Magnum. Now, two years down the road, I’m thinking I might have been wrong all along. Accuracy is more about good barrels and good ammo than cartridge design, so we can theorize that the .300 RUM or Jarrett or WSM might be the most accurate fast .30, but well-built rifles make you question that. Over the years I’ve seen a lot of .300 Winchester Magnums that were stunningly accurate, and both of these are. You’d expect the Jarrett to be but, initially, the LAW .300 edged it out. Now that the Jarrett barrel is broken in it groups a bit better. Both rifles shoot under one MOA with almost anything, and both group well under a half-inch with loads they like. Although it may not be as personal a statement as an oddball cartridge, there’s nothing wrong with choosing a popular cartridge. Honestly, I no longer have time to handload like I once did. Everybody loads for the .300 Winchester Magnum, so there’s a rich load selection. Both rifles really like Hornady’s 180-grain SST, but I just got in some Black Hills Gold with 180-grain AccuBond; on a too-windy day the first group out of the Jarrett was just over a half-inch. Looking good! We can certainly say that a full-length fast .30 with a 2.85-inch case holds more powder than a 2.62-inch case, so has the potential to be faster. However, I’ve long known that my .300 Weatherby Magnums and RUMs needed a 26-inch barrel to strut their stuff. As a primarily Western hunter I’m not bothered by long barrels but, realistically, if you aren’t getting a lot of goody out of the extra length there’s no real reason to carry it around. Not being a .300 Winchester Magnum guy, there’s something I’ve missed. The popularity of the cartridge has led to a lot of load development, and with newer propellants the velocity gap has narrowed. In Weatherby’s ammo (loaded by Norma) the .300 Weatherby Magnum is now rated at 3,250 fps with a 180-grain bullet; the .300 RUM the same. Other loads for the .300 Weatherby Magnum are a bit slower, down in the 3,100s. The .300 Winchester Magnum has traditionally been rated at 2,960 for standard loads with a 180-grain bullet. There’s no real magic in getting a 180-grain bullet to 3,000 fps, but it sounds better, doesn’t it? That standard Black Hills Gold load I just shot delivered 3,015 fps over the chronograph. Hornady’s Superformance load with 180-grain SST is rated at 3,130 fps…but in both of these rifles (with 24-inch barrels) it actually delivers about 3,180 fps, which is knee-deep into .300 Weatherby Magnum territory. Cartridge popularity means load development, and with newer propellants .300 Winchester Magnum velocities have been increasing. Rifles vary in velocity, but in Boddington’s rifles Hornady’s 200-grain ELD-X clocks well over 2900 fps; Black Hills Gold’s 180-grain AccuBond load exceeds 3000 fps; and Hornady’s fast Superformance 180-grain SST load is nearly 3180 fps, well into .300 Weatherby Magnum territory. Obviously factory loads will vary in accuracy, but with the .300 Winchester Magnum, there’s a wide choice. Of course, at some point velocity is just a number; way out there, aerodynamics and bullet performance are more important. Hornady’s new Precision Hunter load with its 200-grain ELD-X bullet is thus very interesting. Construction aside, bullet weight covers a lot of sins, so for elk and African plains game I’ve often hedged my bets with 200-grain .30-caliber bullets. That Precision Hunter load is rated at 2,850 fps, on the fast side for a 200-grain bullet in the .300 Winchester Magnum. Except that’s another conservative rating: In my rifles actual velocity averages about 2,920 fps. I took the .300 Winchester Magnum to South Africa last year, where I could mess with some different loads at different ranges. I’m going to do it again this year. Mind you, I have not yet fully converted from my beloved .300 Weatherby Magnum—we go back too far—but these days, when you combine versatility, efficiency, and effect on game with availability, I have to admit it: The .300 Winchester Magnum is pretty hard to beat!